Check our FAQ to see if we have already answered your question. 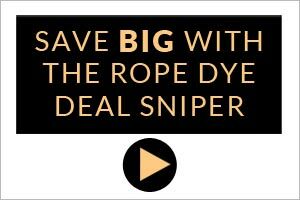 What are the delivery costs for orders at Rope Dye? Inside the EU, you’ll not pay a penny and we are presently offering free worldwide too. Which payment methods are accepted on Rope Dye? We currently accept secure payments via Paypal. You don’t need an account with them and we all benefit from world-class safety and security. Customers in Germany and Denmark can also pay by bank transfer. Your order will be sent directly to you by our Brand partners who will always aim to dispatch within 1 – 3 working days. However, there may be circumstances beyond our control which could cause delays and in such circumstances we will try to contact you via email or telephone. We aim to make the process as painless as possible. The time it takes for your goods to arrive will depend on the distances and countries involved but you will sent tracking details so that you know the precise status of your delivery. If you have opted for a made-to-order product, delivery will take a little longer and we indicate dspatch times on the individual product pages. Purchases made online are governed by the “Consumer Contracts Regulations” and you have 14 (fourteen) days from receipt of your goods within which to return them for refund or exchange. Returned items received after 14 days will be offered a store credit at our discretion. We cannot not accept any returns after 21 days. All goods should be sent with a returns form. If you wish to return the goods, please enclose the form indicating if you wish a refund or different item. Items must not have been worn or used in any way, they must have any labels intact and be returned in the original packaging. If we have made a mistake with your order or the goods are faulty, please let us know immediately and we will do our best to resolve the issue at once, and all return shipping costs will be refunded to you. In all other cases, the cost of returning the item and responsibility for the item is yours until it reaches us therefore we recommend using a trackable, insured service. We are unable to refund any original shipping costs. Tailor-made or personalised goods cannot be returned or exchanged unless faulty. Are all Rope Dye prices final? All displayed prices include value added tax (VAT) at 20% unless shown at checkout. For customers who live outside of the European Union, we will deduct the VAT at the checkout when you select your country. Customers outside of the European Union might have to pay taxes, duty and brokerage fees when receiving the merchandise. Customers within the European Union are exempt from all charges, duties and taxes. Because tax and duties differ between countries and states, we can not calculate exact amounts as these charges are imposed directly by your local customs. For further details of charges, please contact your local customs office and do please note that these charges are at your own expense and cannot be refunded by us or our Brand partners in any circumstances. What's the story with gift vouchers? Gift Vouchers are generated electronically and are valid for a full year from the date of issue.